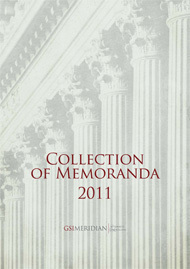 GSI Collection of Memoranda is an annual publication that presents a selection of memoranda, covering various legal issues that were of particular interest to our clients and us each year. For a sample of our latest Collection of Memoranda click here. To stay informed on a variety of current topics, you can join our mailing list.